Since summer is almost upon us, and a lot of people do enjoy a nice cold beer, B.A.F.F.L.E.D. would like to highlight a few North American made brews to cool you off! 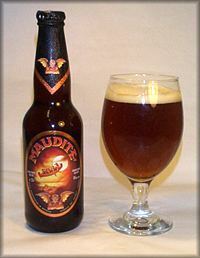 The title may mean accursed in French, but there is nothing unlucky about this strong amber red-ale. It features complex and bold flavors with a distinctive citrus and hoppy nose. It's also 8% alcohol by volume (ABV), which means one may be enough to have you pleasantly buzzed. This Chicago favorite is a Kölsch style beer with a light and fruity smell and easy drinkability. Goose Island starts selling it in March, but being a seasonal, it is only available until August, so get it while you still can! For an even more "authentic" Goose Island, try one of these fresh off the tap at one of the Chicago Goose Island Brewpubs! Colorado craft beer maker New Belgium runs one of the cleanest beer operations in the world along with some of the most popular and delicious brews from the US. Most people are familiar with their Fat Tire amber ale, but there is a lot more to New Belgium than that; case in point: the Somersault. This summer seasonal is easy to drink, yet has a little bit of complexity and hoppiness, coming mostly from the ginger and citrus notes. It should be fairly easy to find in bottle form and on tap, probably until the end of the summer. This Belgian style pale ale comes from the Cooperstown, NY Ommegang Brewery. A faithful interpretation of the Belgian Style beer, the BPA (which stands for Belgian Pale Ale) has a little kick to it (6.2% ABV), but had a refreshing citrus and floral taste with a hint of hops lingering in the background. This beer is very balanced and readily available year-round. Bell's Brewery, located in Galesburg, Michigan has an impressive lineup of unfiltered craft beers, and is mostly regional. One of their more well known is their Oberon, a summer seasonal. It is a spicy and refreshing wheat beer, and is available in multiple forms (bottle, draft, mini-keg). To experience it at its most quenching and crisp, either try it from a frosty bottle, or get it straight from the tap. Even though summer has not officially started, it's never too early to seek out one of these tasty beers. If you are having trouble locating any of these, many of the websites associated with the beers have a beer locator, or you can email m@thebaffledblog.com, and we can help you find what you are looking for. Either way, happy drinking and remember to enjoy responsibly!